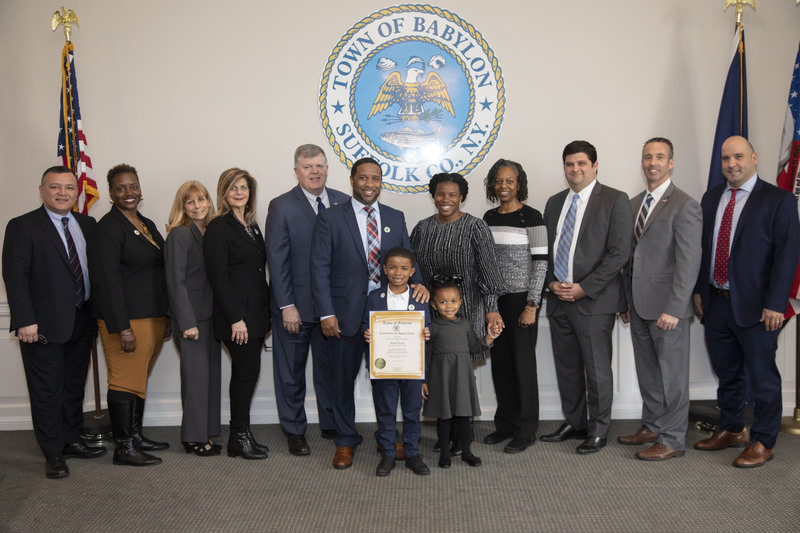 Town of Babylon Supervisor Rich Schaffer, Deputy Supervisor Tony Martinez, Councilwoman and Beautification Program Chairwoman Jackie Gordon and the rest of the Town Board recently welcomed six-year-old Payton Lewis to Town Hall and congratulated him for his new position as a Junior Ambassador. Payton caught the attention of the Beautification Program, led by Director Viscel Moore, when they learned about his service “Payton’s Planet.” Payton learned about the importance of recycling at Deauville Gardens West Elementary School in Copiague on Earth Day and decided he wanted to help. Now, he visits homes and businesses to pick up their bottles and cans before bringing them to a recycling center. As a Junior Ambassador, Payton will take part in local cleanup efforts and continue to be a positive influence on his friends and classmates while teaching them the importance of keeping the planet clean. Photo (left to right): Tony Martinez, Viscel Moore, Gerry Compitello, Corinne DiSomma, Rich Schaffer, Bradley Lewis (father), Payton Lewis, Mackenzie Lewis (sister), Shakira Lewis (mother), Jackie Gordon, Anthony Manetta, Terry McSweeney, Joseph Wilson, Town Attorney.